Robert Dior Homme ad pic. . Images in the Robert Pattinson & Kristen Stewart club. 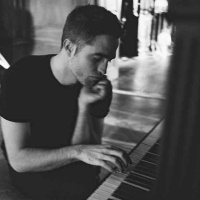 This Robert Pattinson & Kristen Stewart icon contains पियानोवादक, संगतकार, accompanyist, सहायक, साथियों, and असद. There might also be हस्ताक्षर, पोस्टर, पाठ, चॉकबोर्ड, साइन, and साइन इन करें.